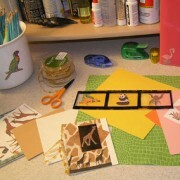 IdeaStix products are so versatile that many of them can be used for your favorite craft projects. Turn your imagination into reality. IdeaStix Accents and DesignStix offer a special touch to make ordinary things beautiful. Use inkjet and laser printers to create exciting and uniquely your own custom products with PrintStix Ultra and Canvas. PrintStix Ultra is great for creating your own designs and using them for laptop/notebook covers, plastic binders, and for labeling as well.